"I have always been fascinated with and inspired by the ways we transform ourselves throughout our lives. Glass has transformed me in ways that are difficult to describe with words. Some of my work is drawn from aspects of my past experiences and some is drawn from dream-state surrealism. Through my work, I try to faithfully express my life's passions, my growth, and my voice." 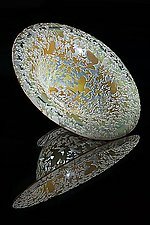 Artist Lisa Tate has been interested in glass since she was a preteen engraving on glass bevels with her father's Dremel engraver. 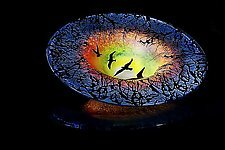 An avid naturalist and hang-glider pilot, she often draws from nature and personal experiences to convey her thoughts and passions. 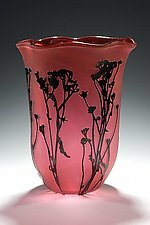 Tate specializes in "cameo" glass work, a rare technique that combines three major disciplines: glass blowing, designing, and engraving. 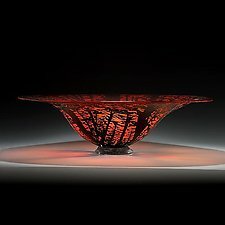 She begins each piece by blowing multiple layers of colored glass that are overlaid on top of each other, sandwiched between layers of clear glass. 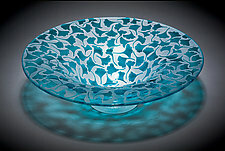 Once the form is blown and cooled, a design is drawn on the piece. Tate then cuts through each layer to reveal her colors and design. 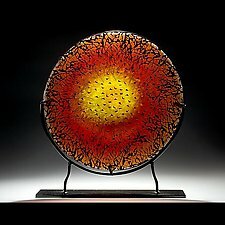 Lisa Tate is a glass artist living in Boise, Idaho. 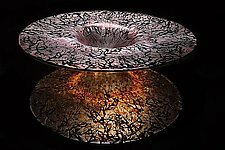 She has studied glass blowing and engraving at the Bay Area Glass Institute in San Francisco, the Pratt Fine Art Center in Seattle, Zion Art Glass near Boise, and Corning Studio in Corning, New York.